Notice the significant travertine damage. 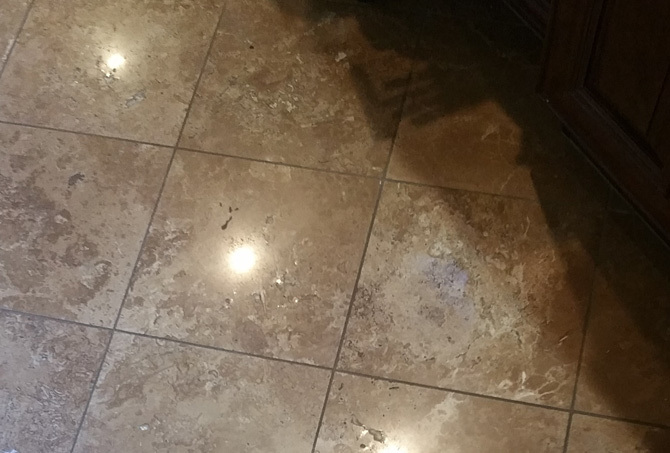 Here is the same section of the floor with the travertine damage repaired. Here is the floor before our travertine restoration work. 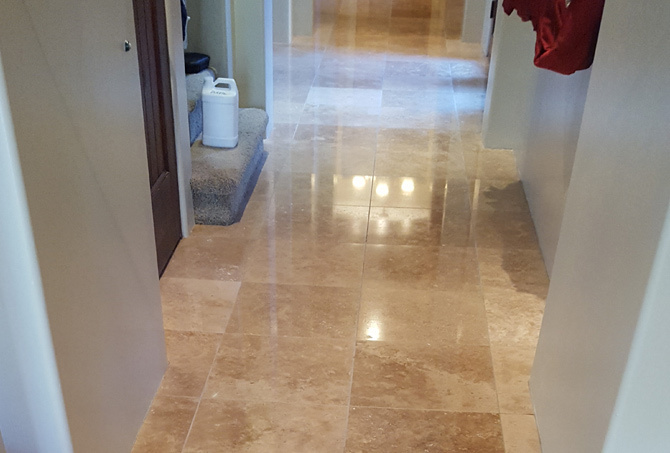 This vertical shot of the travertine floor in the hallway shows the clean floor in the top half of the image and the dirty floor in the bottom half of the image. Here is another before and after shot. 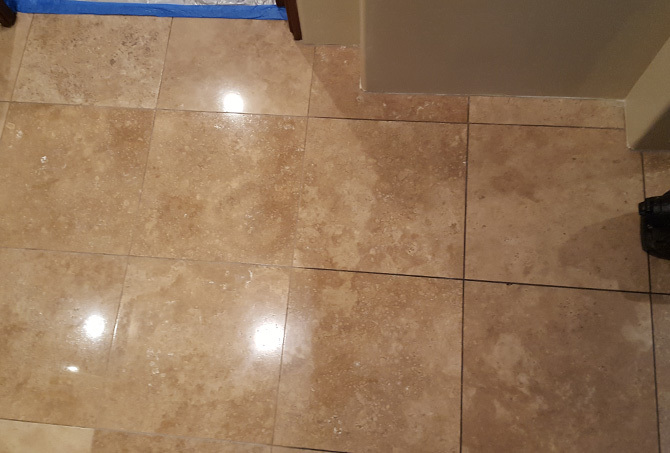 The left side of the image shows grout lines that have been cleaned and the right side shows grout lines that have not yet been cleaned. 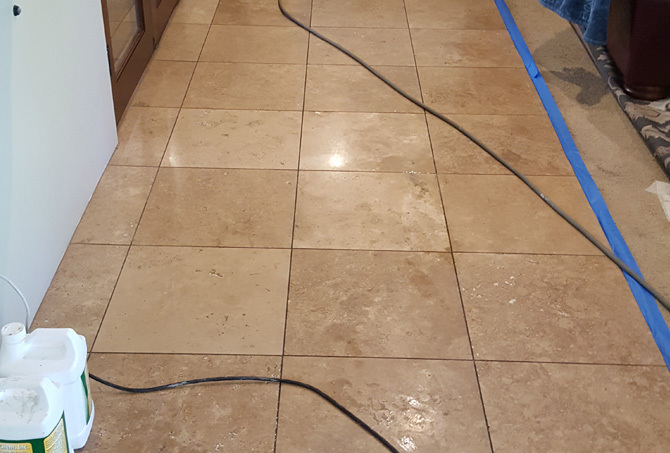 See for yourself how we can make dirty, damaged travertine look like new again. 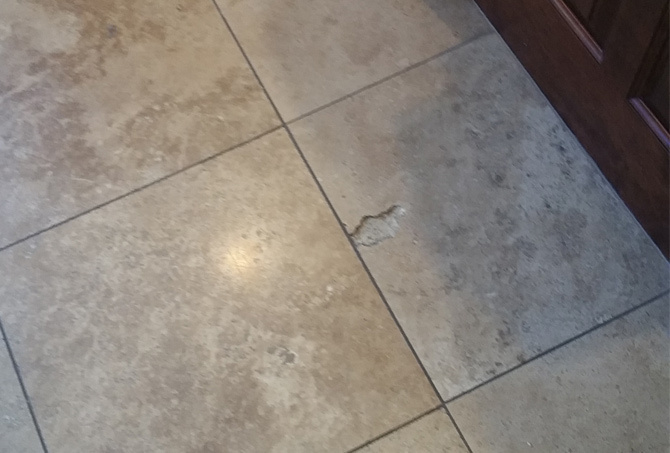 The travertine floor in this Phoenix home not only looked dull and dingy, but had a spot where the filler popped out of a naturally-occurring hole, posing a trip hazard. The homeowners called Beyond Stone Solutions to find out whether the hole could be repaired. We assured them that we specialized in all kinds of travertine repairs, including filling holes. We used a custom-tinted epoxy mixture to fill or “float” the travertine, filling in the hole. 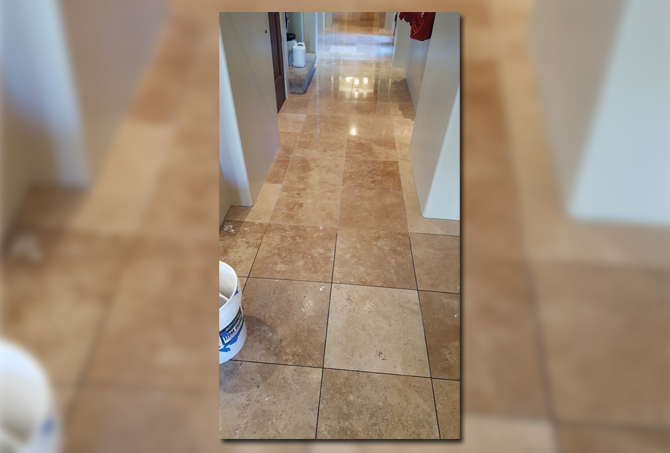 To restore the color and luster of the entire floor, we honed the travertine, virtually erasing scratches, dullness, and other surface damage. Then, we polished to give it a beautiful shine, and cleaned and sanitized the grout lines. Finally, we applied an impregnating sealer to inhibit staining. The homeowners were so glad when they saw the place the hole had been and how well it blended with the surrounding area. They were also thrilled with the the appearance of the entire floor, especially the grout lines.